Make an impact with some black and white, not all cards need to be colorful! 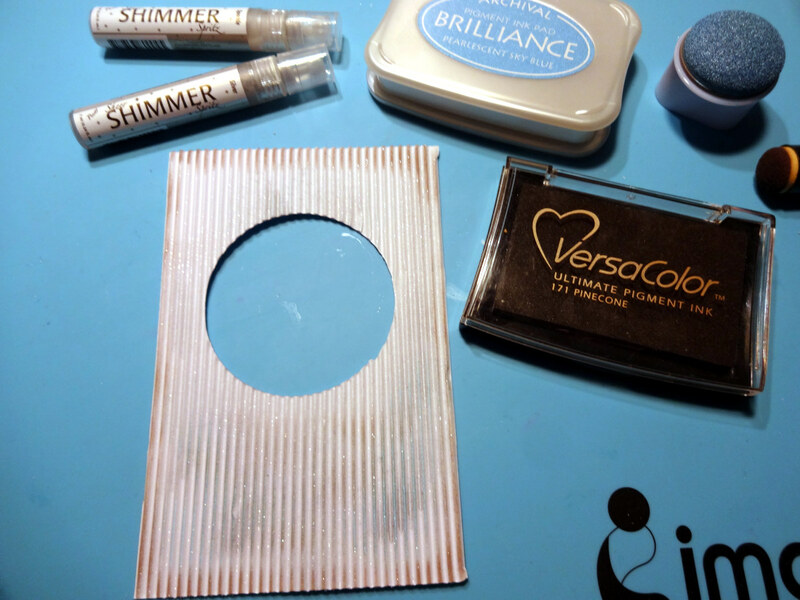 For my card today I share how to do a resist technique using a stencil, VersaMark, and Fireworks! Spray. This really is an easy technique and the results are so cool! So grab a stencil and some Fireworks! Spray and let’s get started…. Watch my video tutorial below to learn how I did the resist technique. Enjoy! 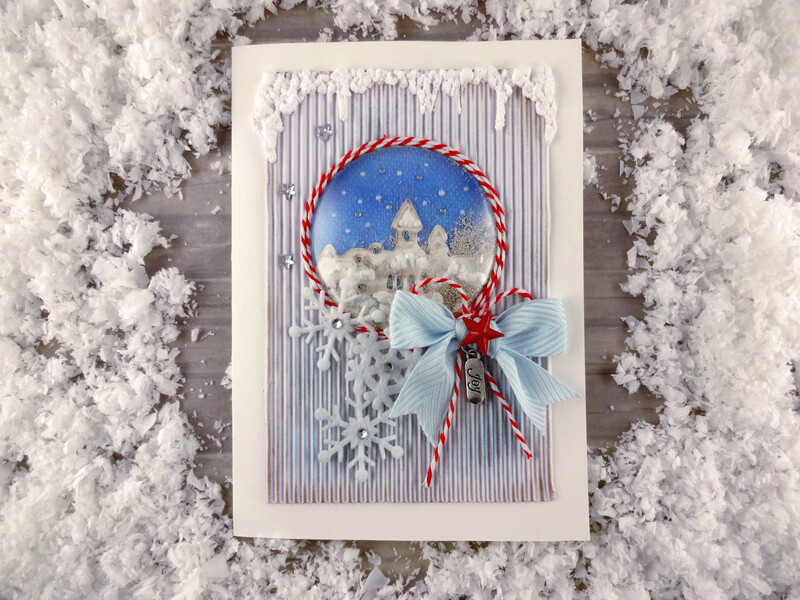 Create the feeling of a snow globe on a Christmas greeting card with a shaker bubble front and a lot of snow. This Christmas card has less color in the background in order to enhance the centerpiece. 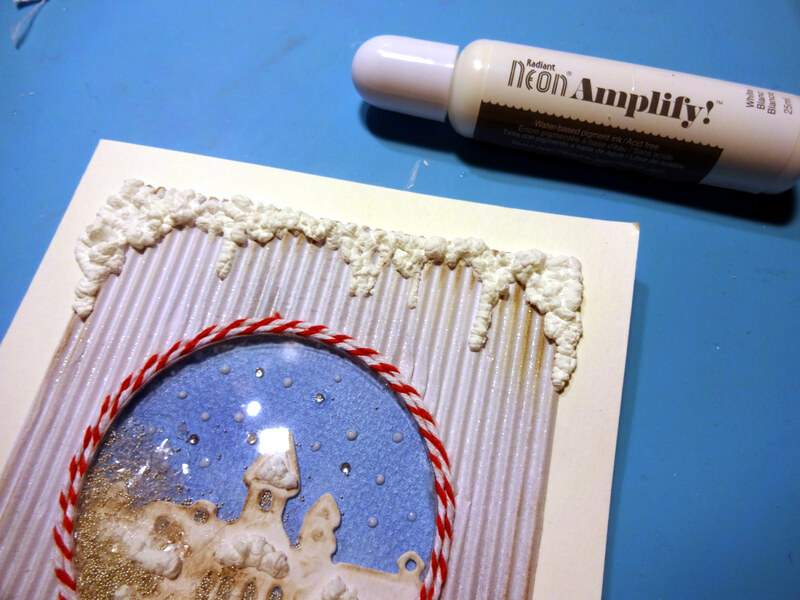 The snow both in the bubble front and on the top of the card is created with the Amplify White, a must have craft supply for Christmas and winter! 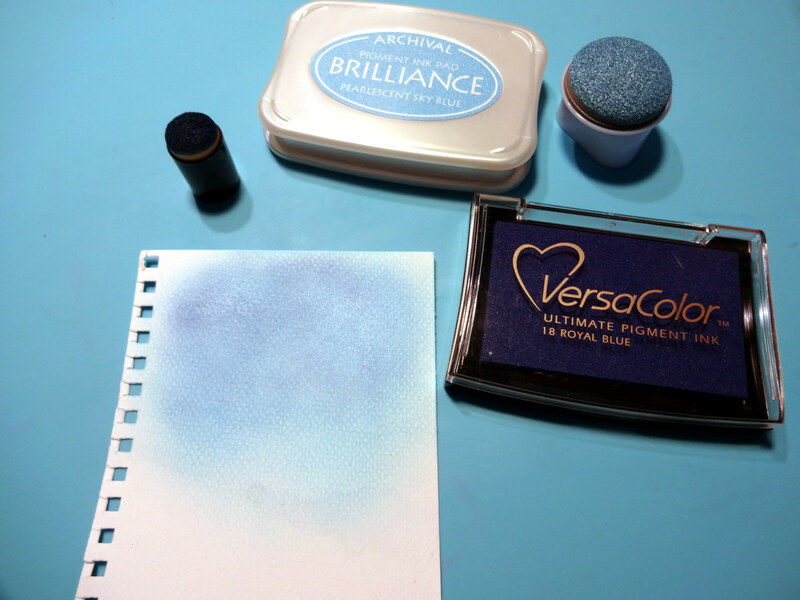 Blend the Brilliance and VersaColor blues on the watercolor paper and cut a circle in diameter slightly larger than then bubble front. Die cut the village shape from the watercolor paper and make light shades using the VersaColor Pinecone and a Brushstix. Die cut 3 more village shapes and glue on top of each other to make a thick one. This will add dimension (depth) on the design and act as an obstacle to the beads inside the bubble. 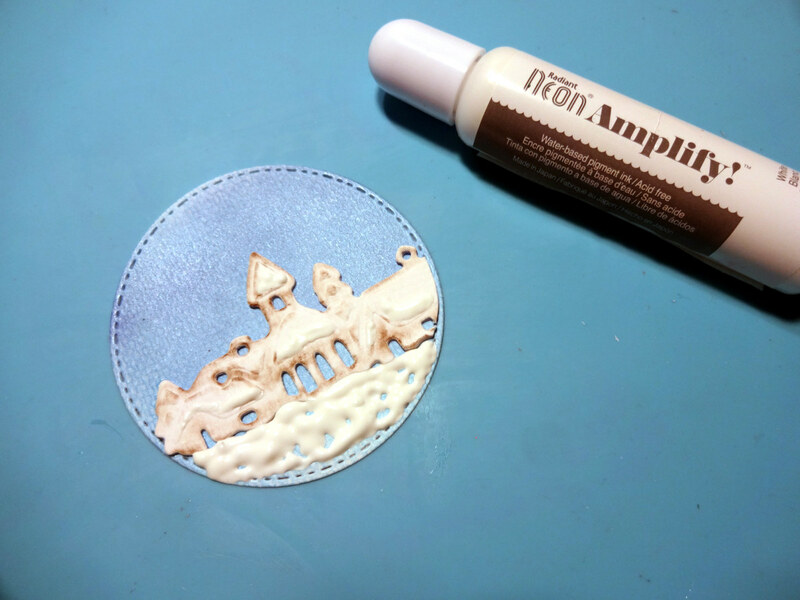 Glue the village die cutting on the watercolor paper and cover the bottom of it with Amplify White and heat to activate it and make it fluffy. 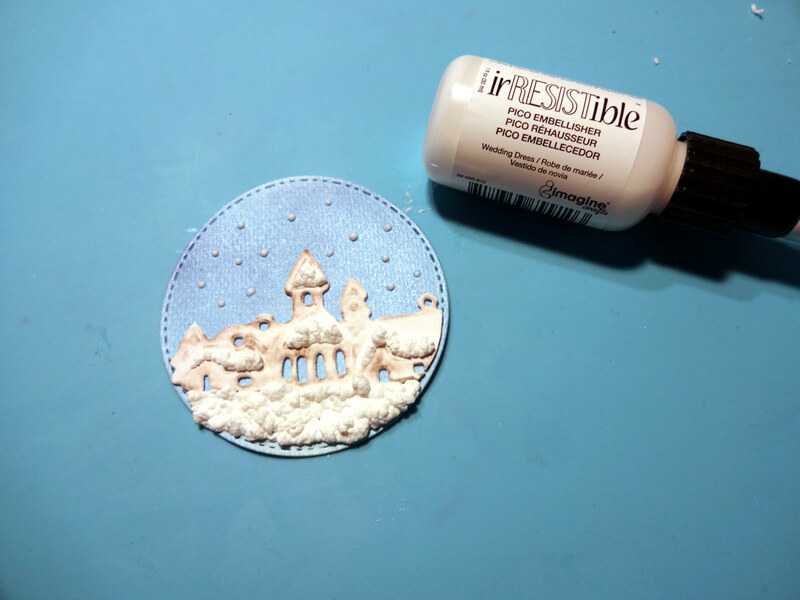 Make tiny dots of snow above the village using the irRESISTible Pico Embellisher Wedding Dress color. 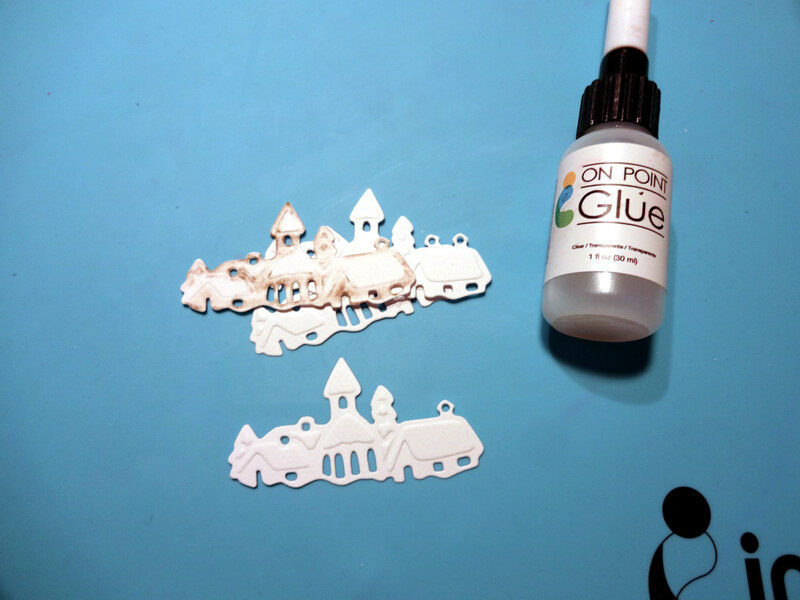 Add rhinestones with the help of On Point Glue. 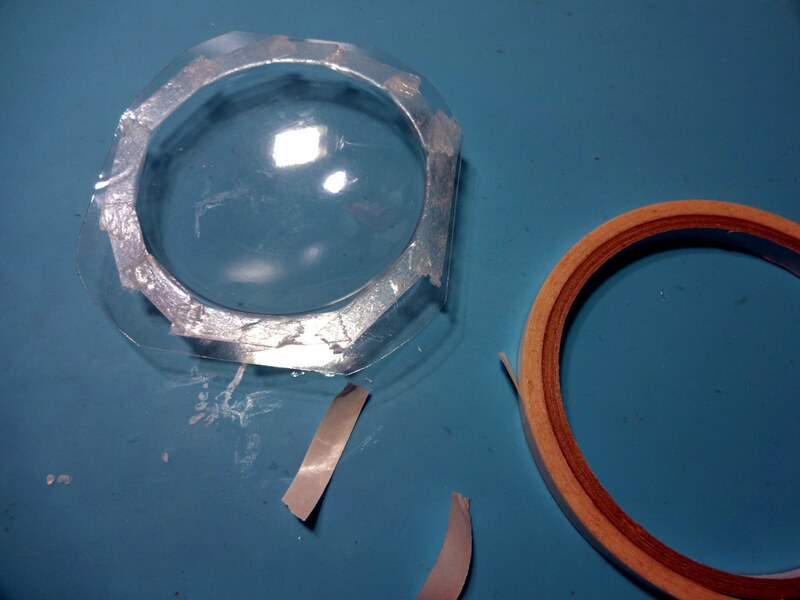 Cut from a 4 x 6 piece of the corrugated paper, a round center, large enough to for the bubble front. Distress with Brilliance Pearlescent Sky Blue, VersaColor Pinecone and spray with Sheer Shimmer Sparkle and Silver. Remove the excess of the shaker bubble front and add Tear It Tape, all around it. 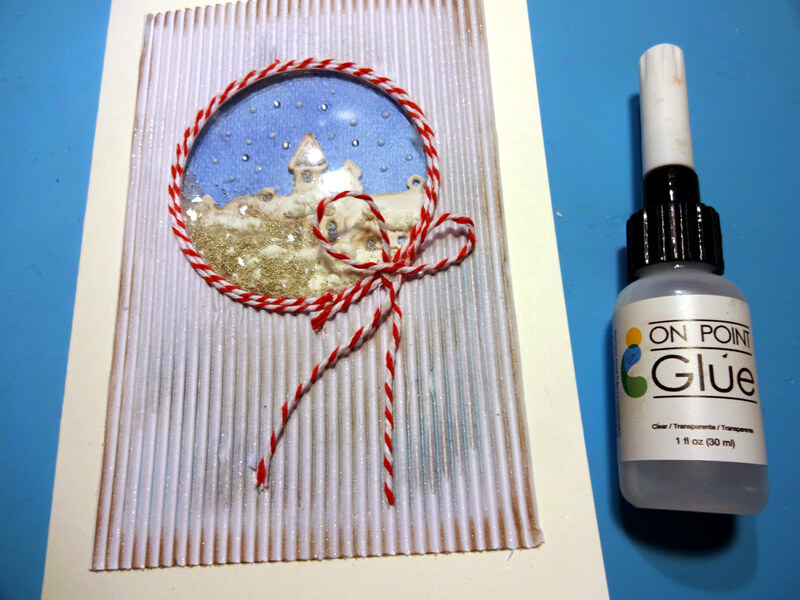 Glue the watercolor paper circle on the card, add beads in the center before covering with the bubble front. Continue by placing the corrugated paper and the twine. Use Amplify! White on top of the corrugated paper piece to make snow effect. 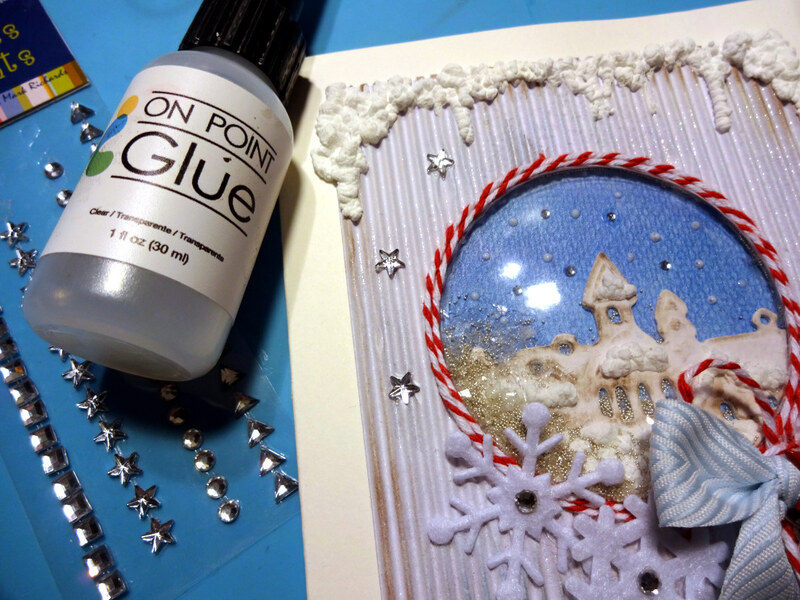 Add the rest of the embellishments using On Point Glue and your hot glue gun (for ribbon elements). When we challenge our artists, we are always pleasantly surprised at the outcome. Sometimes there are similar ideas that pop up in the creative process between two talented people and today’s projects share this common trait — matching! Kyriakos matches colors to create color harmony and Alison matches a scrapbook page to a 2-D style. Check it out! I love the Pineapple color challenge this month and decided to create a blooming flowers card on yellow shades in contrast with the kraft card and the black details used. Using the kraft paper with white, yellow and black all match to create a warm color harmony that turned out rather nice. First, I used White Embossing powder on the kraft card base to give texture and add detail on the frame. Then I colored the paper flowers with Memento Desert Sand and Dandelion and filled their centers with Radiant Neon Amplify to add volume. For the top panel background, I inked a large stamp in a distressed style with Memento Dandelion and Tangelo ink and pressed on white cardstock. 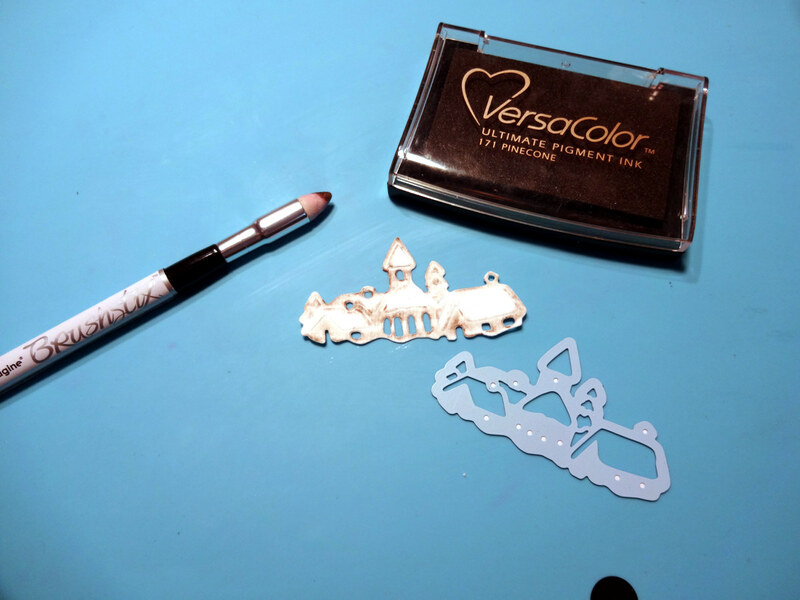 The leaves are pressed in the VersaMark ink and then covered with the Imagine’s Silver Embossing Powder and heat set. To finish the card, I arranged all these elements together and used a piece of black corrugated cardboard to give the design contrast and ground the overall look. Hello! The Artists in Residence for Imagine and Waffle Flower Crafts did a collaboration in May. As a result, I was sent the adorable Enveloper Little Birdie Stamp Set and I love using it. Looking at their other sets, and I now have a nice wish list I would love to add to my collection. I decided to make a scrapbook layout with the Little Birdie set because it reminded me of the matching Marimekko dresses my daughter and I have. The flowers on the dresses are 2-D flat design style and only use one color. I wanted to match the dress design. So, I stamped my images onto white cardstock with VersaFine ink in Majestic Blue and used Memento Markers to match colors on the dresses. I love to shade and blend when I color, but I really wanted to stay true to the fabric and keep the colors flat. I created a mat around the white cardstock with Banana Pepper cardstock from My Colors cardstock, and I stamped my sentiment down the side with Habanero VersaFine ink. Then, I wrote the date of the photos with a Danube Blue Memento Marker. My blue base cardstock was looking a little plain, so I sprayed it with New Sprout Fireworks! 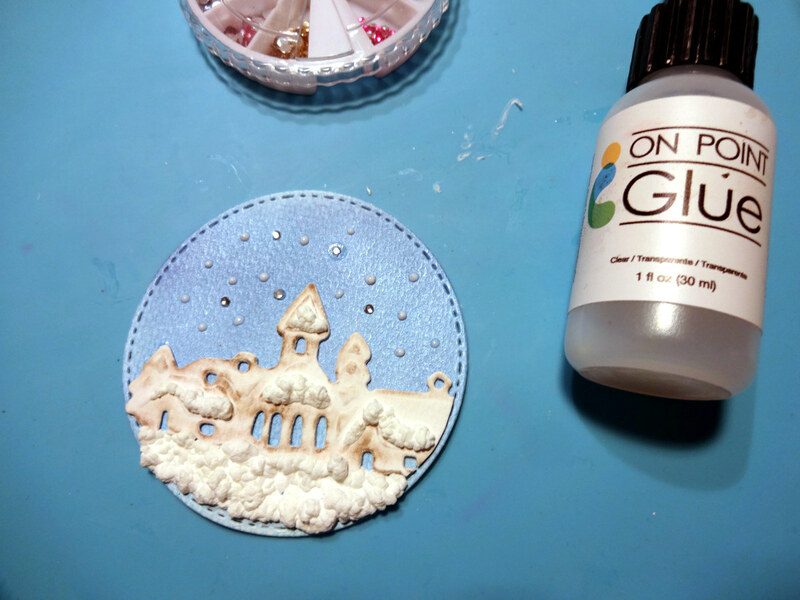 Spray and used On Point Glue to add white sequins. I’m really happy with how well the stamped images from Waffle Flower went with our dresses. I think the stamps showcased the photos perfectly! Have an inspiring day!